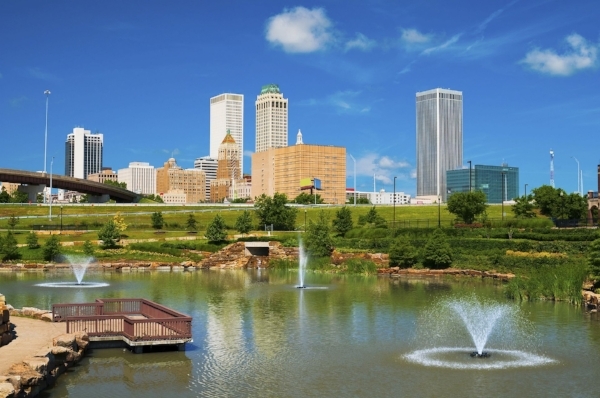 For the last three decades, Tulsa, OK has been utilizing a comprehensive floodplain management strategy, which allowed the city to shift from a reactive approach to flooding problems to a proactive one. Tulsa’s strategy includes innovative and creative structural and non-structural measures. The city has regularly reevaluated successes and failures of the program, incorporating lessons into subsequent policy cycles, within the framework of a supportive organizational and community environment. Blue Dome District, Tulsa, OK.
Tulsa, Oklahoma is located along the Arkansas River in a region nicknamed “Tornado Alley” for its violent thunderstorms, which often produce tornadoes along with heavy rain. Since the city’s founding, it has struggled with chronic flash flooding along Mingo Creek. In the 1960s, this watershed experienced one flood every two to four years. As the region increasingly urbanized, the frequency and severity of the floods were compounded due to increasing volumes of runoff from impervious surfaces. Before the establishment of the National Flood Insurance Program (NFIP) in 1968, there were few restrictions or disincentives to building in the floodplain. Various structural and non-structural measures were applied from the 1970s to early 1980s, but loss of life and property continued. The most recent serious flood in Tulsa was the Memorial Day storm of 1984 that left 14 people dead and $292 million in damage. The flood of 1984 and others before motivated the city to take a more aggressive and proactive approach to stormwater management and flood control that includes planning and capital projects as well as regulatory measures. Tulsa developed master drainage (MDP) plans for virtually all drainage basins, outlining the most cost-effective solutions for that basin’s flooding problems. The plans are informed by the city’s hazard identification and floodplain maps, which include properties outside the FEMA-mapped floodplain but which are still at risk of flooding. Recognizing the need to combine the multiple MDPs into a single, comprehensive program, in 1990 the City of Tulsa developed its first Citywide Flood and Stormwater Management Plan (1990-2005). Tulsa is currently completing the fourth update to the City of Tulsa’s Citywide Master Drainage Plan. The Mingo Creek Project (1984-1999), one of the most important capital project, was a cost-sharing effort between the city and the U.S. Army Corps of Engineers (USACE) to design and construct a flood control system comprised of a network of landscaped buffers and detention basins along Mingo Creek, together with changes in the organization of city government and land use reforms. Through the Acquisition Program the city removes structures located in flood prone areas and converts these areas into open spaces used for recreation and stormwater storage. Using funds from FEMA’s Hazard Mitigation Grant Program and a 25% local match, the city purchases flooded properties (homes and businesses) after a storm event entered voluntary into the program. Since its beginning until 2004, Tulsa cleared more than 900 buildings from its floodplains. The largest clearance came after the 1984 flood, when more than 300 single-family homes and 228 mobile homes pads were acquired and cleared. Many of these properties have been converted to build greenway parks (including trails, landscaping, stocked ponds, and sports fields) along Audubon, Mingo, and Mooser Creeks. Greenway improvements are financed by a city-leveraged storm sewer facility repair, a construction sales tax, and stormwater fees that are accessed for all new construction projects. Public outreach has been critical to the success of Tulsa’s efforts, in order to gain public support, and with it ensure City Council support through the years. Other small flooding and drainage capital projects are also part of Tulsa strategy to deal with flood. Tulsa’s efforts have been a major success – there has been no record of flooding in any structure built before 1987 and the city is ranked first in FEMA’s Community RatingSystem. Citizens have also benefited from the City’s efforts, receiving a 40% premium reduction on NFIP policies and access to high-quality recreational facilities. In order to ensure the effective management of floods in Tulsa, the enabling environment, including a proper institutional framework, economic and financial mechanisms, and community awareness and education, was developed. The creation of the Department of Stormwater Management allowed the city to centralize all flood, drainage, and stormwater programs. The city clearly defined several economic instruments to ensure successful implementation. FEMA Hazard Mitigation funds were identified as a source. A stormwater utility tax was issued to provide funds to operate floodplain and stormwater management activities. An additional stormwater fee was placed on new construction according to the impervious surfaces regulations included in the project. Tulsa engaged in public education and outreach campaign in order to engage citizens in the planning process. Additionally, this helped build public support for fees and taxes, voluntarily participation in the Acquisition Program, and City Council support for comprehensive floodplain management. Tulsa saw Mingo Creek flooding as an opportunity, structures located in the flood prone area were removed and converted into open spaces used for recreation and stormwater storage. Through Tulsa’s Acquisition Program, structures located in flood prone area were removed, and these areas were transformed into greenways used for recreation. Besides being a recreational asset, during storms these areas act as stormwater detention areas controlling discharge rates and allowing for infiltration, reducing the risk of flooding as well as improving the water quality. Tulsa’s floodplain and stormwater management program includes a comprehensive, watershed-wide, long term management approach. However, the program is not only centered in the natural dimension of flood but also in the socio-economic as well as institutional dimensions. In order to better understand and address the socio-economic dimension, the community was extensively involved during the development and implementation of the different initiatives. In this way, the community not only was informed, but it was also a source of inputs to be considered for the development and implementation of the initiatives. Additionally, this extensive participation enhanced the community‘s appropriation of the initiatives ensuring its social sustainability. In order to ensure its financial sustainability, the strategy is engaged with different type of funding sources, including external sources (FEMAs’ Hazard Mitigation Grant Program) as well as internal ones (stormwater taxes and fees). “Community Case Studies 2004.” No Adverse Impact (NAI). Association of State Floodplain Managers, 2004. Web. 19 Jun 2012. <http://www.floods.org/PDF/NAI_Case_Studies.pdf>. Flanagan, John D. City of Tulsa and the National Park Service. Mooser Creek Greenway: Restoration and preservation of a historic pristine stream. Tulsa, OK: , 2004. Print. <http://www.rdflanagan.com/Mooser/Mooser.pdf>.